You'll find plenty of places to visit near Jeju: Seogwipo (Seongsan Ilchulbong, Cheonjiyeon Falls, & more). There's much more to do: delve into the lush surroundings at Hallasan National Park, head off the coast to Udo, tour the pleasant surroundings at Gwakji Gwamul Beach, and kick back and relax at Woljeongri Beach. To find photos, reviews, maps, and other tourist information, use the Jeju trip maker site . 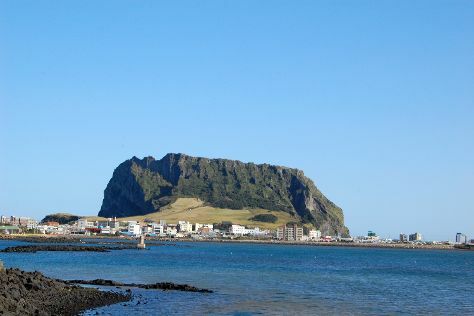 If you are flying in from Malaysia, the closest major airport is Jeju International Airport. In June, daily temperatures in Jeju can reach 28°C, while at night they dip to 22°C. Wrap up your sightseeing on the 18th (Mon) to allow time to travel back home.